Do you love the holidays, but also the environment? There are plenty of festive ways to incorporate your green lifestyle into your home for the holidays. The first thing to always keep in mind is to simplify. Making things simple reduces costs, stress, and waste, and also gives us the time to slow down and really connect with others, which is what the holiday season is really all about anyway. Deck the halls with these stylish and eco-friendly ideas! You don’t have to go with a traditional tree to pack in the holiday cheer. For an easy to assemble/disassemble option, go with a recycled cardboard Christmas tree, such as this Moderno Christmas tree, this year. They’re attractive right out of the box, but can also be decorated with paper, paint or crayons, and can be displayed in clusters for a unique look. Cardboard trees also cut down on storage space, and are made from strong, 100% recycled material that can be recycled later as well. Not into the cardboard look? You could also try a potted, living trees, such as an edible one made out of rosemary. These fragrant trees allow you to decorate without killing trees and double as herb gardens to spice up your holiday meals! Use recycled ornaments, such as those passed down in the family, or use old light bulbs to create new decorations this year using these three creative ideas. 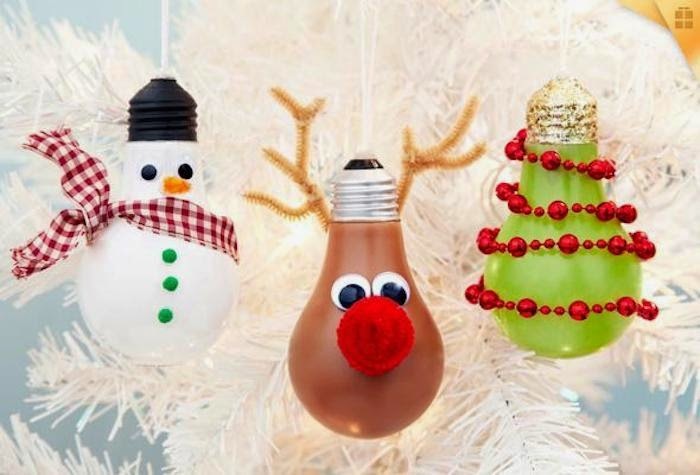 Ideas abound for decorating old bulbs of all shapes and sizes. With a little paint and/or glitter coating the bulbs, your tree will really shine! And remember that less is more! To cut down on your energy use (and bill), you can use tinsel instead of lights to maximize the shine. But if you’re going to string lights around your tree and home this year, make sure they’re LED lights, which come in a variety of styles and colors and use 90-95% less energy than old-fashioned incandescent bulbs and shine for 200,000 hours of use. While you’re at it, set them on a timer, so they’re only used when you need them. It’s an efficient way to save money and the planet! 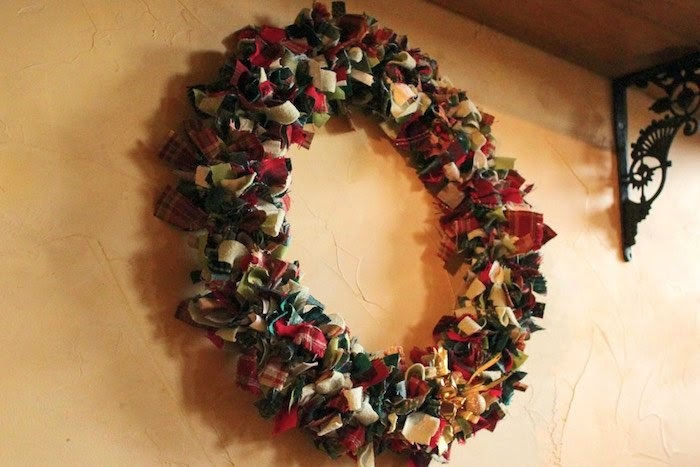 Not all wreaths require cutting branches off of trees, and Inhabitat’s DIY wreath created from recycled fabric scraps is a great example of a more eco-friendly alternative. Follow their easy guide to get started on your own! There are plenty of ideas on Pinterest for home decor, which can be quite overwhelming! But we’ve focused on a couple simple options for your home that won’t break the bank. Create and toss these festive DIY throw pillows out of old sweaters on your sofa, chair or even in the bedroom for a quick holiday decor staple you can use for years. 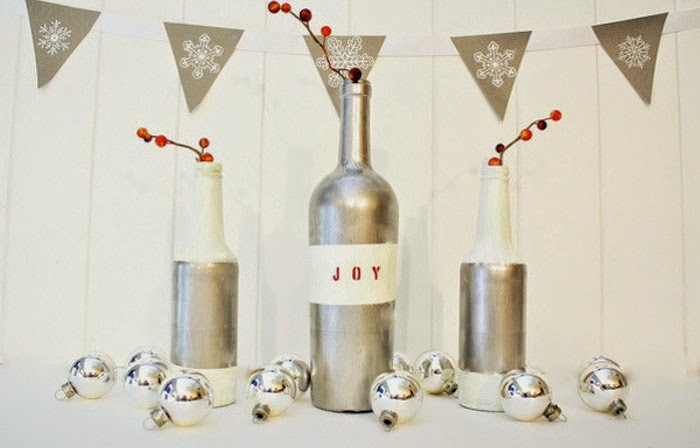 For some table topper or bookshelf decor, try upcycling some wine bottles with metallic paint or create winter vases with some dollar store finds for a very cool look that will carry into the new year. Dress up your dining room for sit-down gatherings! 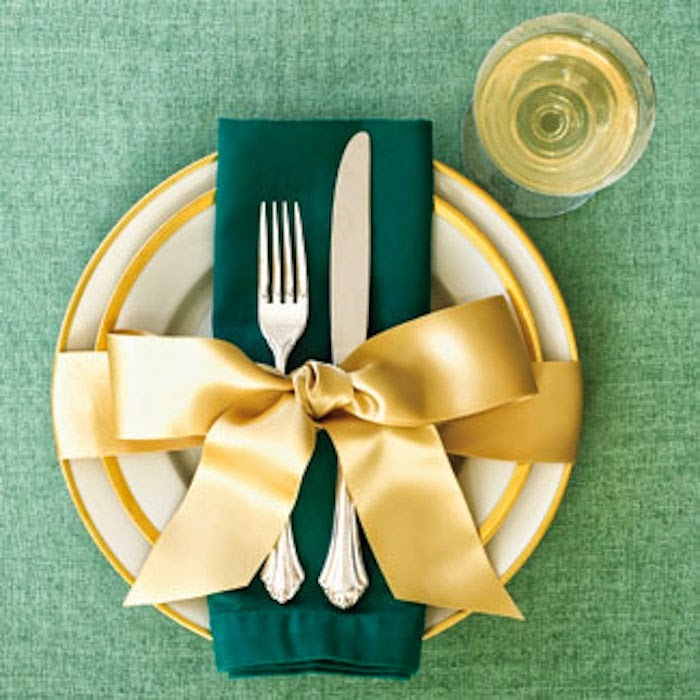 For a simple, yet stunning way to show off your holiday place settings, wrap each set with a wide, pretty ribbon. Save the ribbon for another party or to wrap presents later! For a festive centerpiece display, use a cylindrical glass vase to display a tall pillar candle and holder surrounded by fruits and nuts, such as a colorful combination of walnuts, cranberries, and kumquats. For a vintage look, you can also create your own table runners and candle holders like these pretty candle holders by wrapping lace around Mason jars. Besides the obvious use of menorahs that have been passed down for generations, buying or creating your own menorahs made out of reclaimed wood, metal, or glass is another stylish, eco-friendly look. Latkes taste so much better by the glow of the menorah, so light up your living space with these toxin-free, 100% beeswax, hand-dipped Hannukah candles. During the busy holiday season we need some fast projects, and this DIY table runner requires only a great piece of fabric and some thread. But the best kind might be the “no-sew” variety, and HGTV has rounded up a few awesome table runner options that require zero sewing skills. Hopefully, these ideas have sparked your imagination for even more eco-friendly possibilities for decorating your home this festive season.